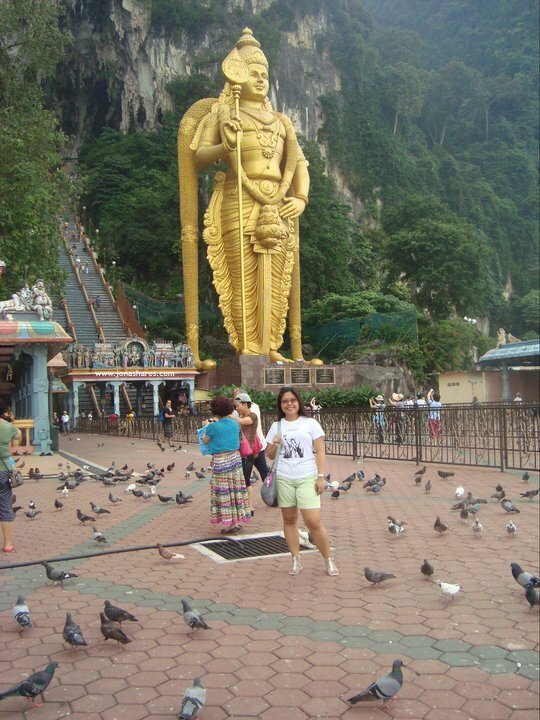 When you visited Kuala Lumpur Malaysia, Batu Caves is one of Kuala Lumpur’s most frequent tourist attraction there since you can easily go there via train. Indeed a very accessible destination. It is a limestone hill comprising three major caves and a number of smaller ones. Batu Caves is located approximately eleven kilometres to the north of Kuala Lumpur, it is a hundred-year-old temple that features idols and statues erected inside the main caves and around it. Incorporated with interior limestone formations said to be around four hundred million years old, the temple is considered an important religious landmark by Hindus. 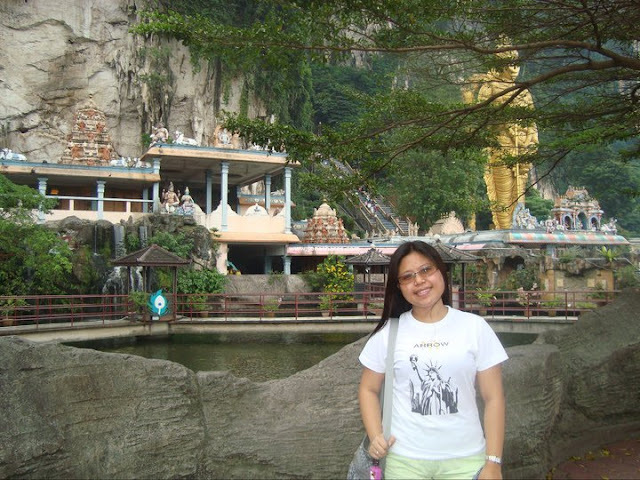 The four main attractions at Batu Caves are the Cathedral Cave, Dark Cave, Cave Villa and Ramayana Cave. This is the main cave out of the four attractions inside the Batu Caves. 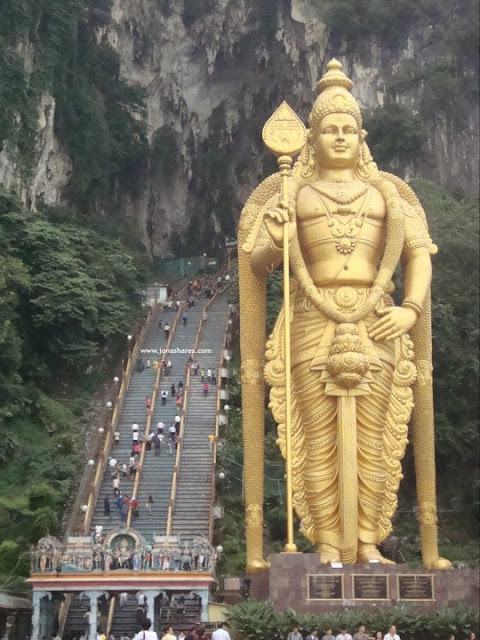 Lord Murugan is the forty-two meter gold statue guarding the cave, he is the Hindu god of war and victory. To be able to reach this Temple, one needs to take the two hundred seventy two (272) steps of stairs. No entrance fee for this temple but donations will be highly appreciated. 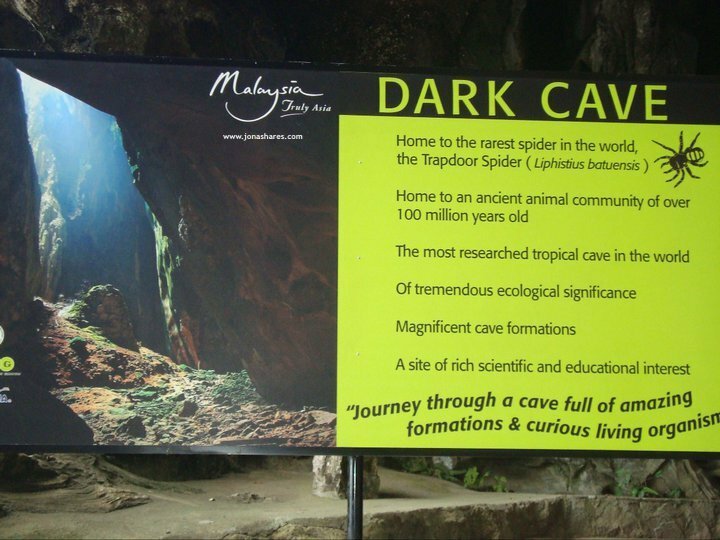 Dark Cave is a cave with educational and scientific touch. It is said to have ancient animals and rare species of spider, but usually, there are group of bats and cockroaches. An Educational tour that depicts the different rock formations and a more intense Adventure tour is offered on this cave. However, the latter tour requires advance booking. This cave is not always open and some parts are off-limits. This cave lies at the foot of Batu Caves. From the solemn Cathedral Cave and the Dark Cave, this third attraction is a colourful one. You would see coloured lights and statues and paintings. A part of the cave will show a collection of reptiles and other animals. However, this is not free. There is an entrance fee of RM15 for non-Malaysians residents. It is a fifteen (15) meter green statue of the monkey God, Hanuman guards the entrance of Ramayana Cave. The cave depicts scenes and statues from Ramayana, an ancient Indian epic poem. The cave is also colorful one, just like Cave Villa. It is also not for free. You have to pay the entrance fee of RM5 upon entering the cave. If you wished to witness the annual celebration of the Hindu at this place, try to visit from January to February. Thousands of worshippers are doing some strange ceremony like piercing the skin, mouth, and tongue with skewers and hook. Though strange as it may seem, many visitors are actually visiting during this season to witness the said ceremony. If you get hungry after the tour, you can eat at the vegetarian restaurants (that serves Indian dishes) in the area. Batu Caves are open daily from 7 am to 8 pm. Do take note that this place is a sacred one so short skirt, short shorts, and hot pants are not allowed. 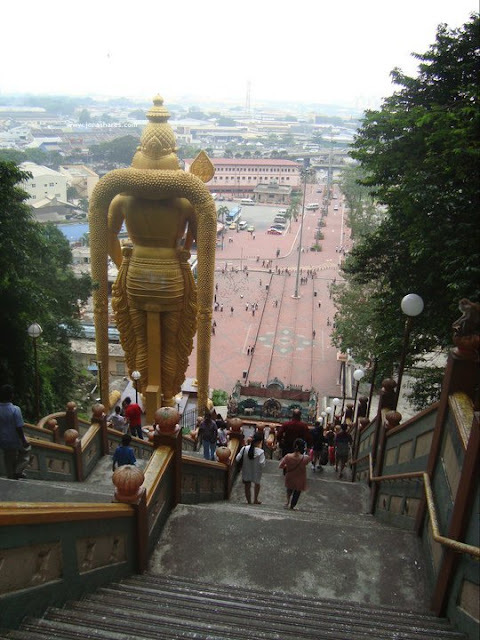 How to go to Batu Caves? You can go there via Train, Bus and Taxi as it is very accessible. To get to Batu Caves, you just have to take the KLM Komuter train at the KL Sentral station. No worries as you the station name "Batu Caves" is your drop off point. It is exactly the Batu Caves stop. Just walk and follow the trail going there. From KL Sentral, take the monorail service to Titiwangsa station. Alight here and take the bus going straight to Batu Caves. Man oh man is that ever a bunch of stairs. Bet the view is great at the top. Would be fun to see everything. WOW. 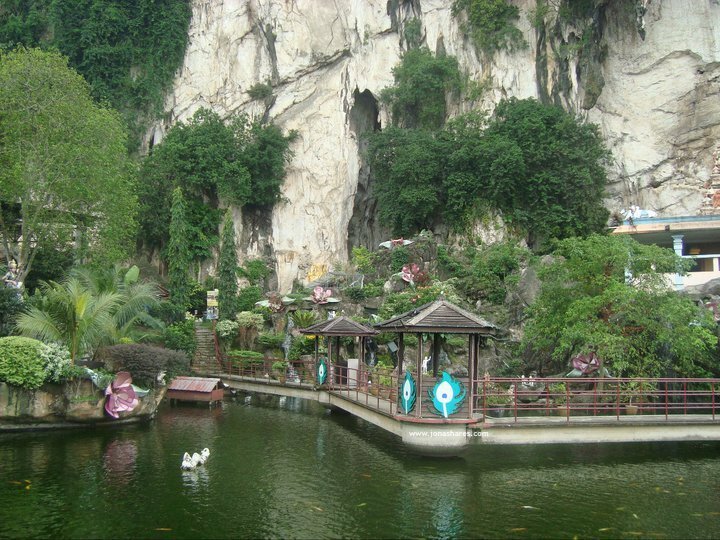 From your pics, Malaysias Batu Caves looks freaking AH-MAZING!!! Wonder how the weather is there? My NEXT "go-to-place" I am placing on my vision board. Thank you so much for sharing your travel ventures. I love seeing this!!! This looks like an amazing destination! The stairs look worth the climb for that view! 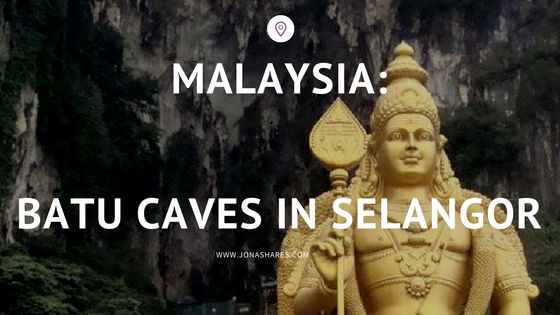 I have never thought of Malaysia as a destination but the spiritual nature and the natural caves do look amazing. I look forward to hearing more about your trip. Those Batu Caves look incredible. I would definitely visit them if I ever visit Kuala Lumpur! Wow your pictures are stunning! I can only imagine how beautiful these caves were in real life. Wow. What a fun experience! That looks like such an interesting place to explore. And the first statue you are posing with is very unique. 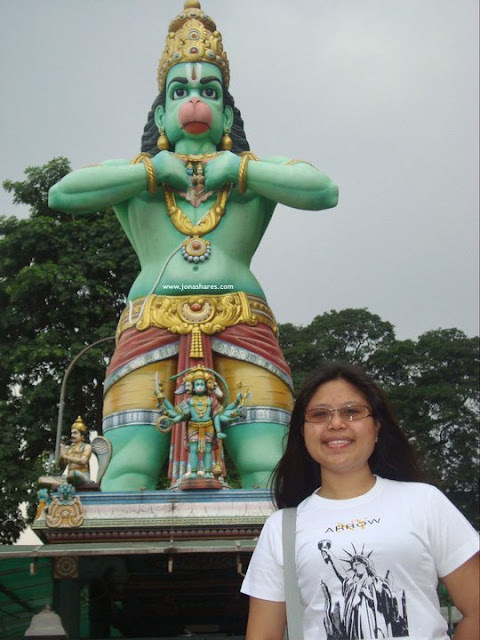 I've never heard of the Batu caves, but we like to check out these kinds of places when we travel. 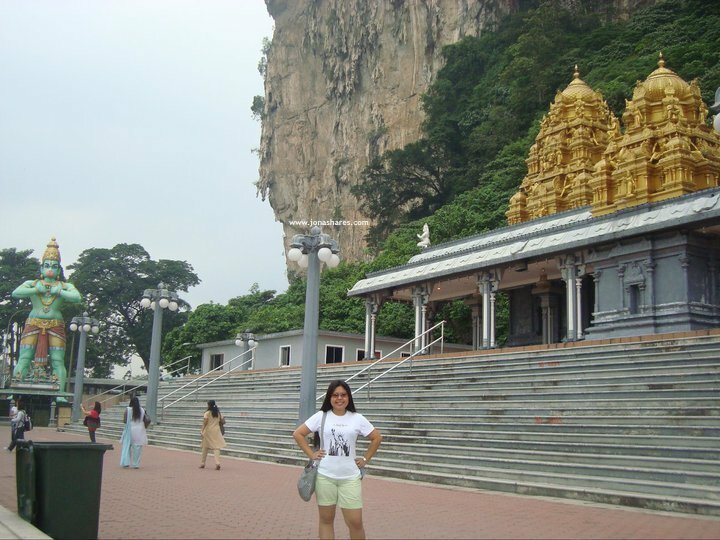 I have heard of the Batu caves, and I hope to visit them one day with my family! What an amazing experience you had. My daughter watched your video and now she wants to visit. wow those stairs! I'm not sure my body would make it haha But it sure is beautiful. OMG! These are such beautiful places! I love to visit places full of history, natural beauty and culture like this one! What an amazing place to visit! The Lord Murugan gold statue is so impressive! I'm sure all those steps are worth the visit to the temple.